Add an organic feel to your bird sanctuary with the Whitehall Oak Leaf Suet Feeder. 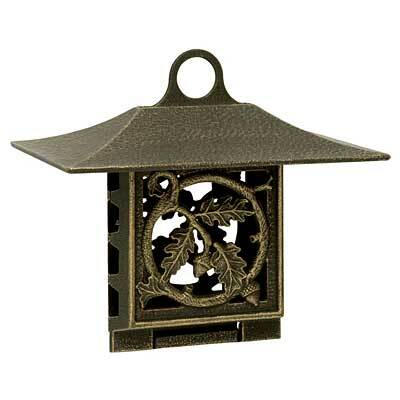 This lovely feeder seamlessly blends a natural motif with manmade, sturdy elements. Oak leaf and acorn shapes on the center of each panel bring the forest to your feeder, and detailing on the accents highlights its handcrafted elegance. These two interlocking panels form a cage which holds one suet cake, while the oak leaf patterns create a matrix through which birds reach the suet. A large roof protects the feeder from moisture, and its hammered finish adds dimension. The lighter highlights on the bronze colored feeder will certainly dazzle in the sun, for even more interest, and the sturdy aluminum construction will last for years to come. Use the included "S" hook or built-in hanging ring to hang this feeder anywhere. Add stately elegance to your bird garden with this Oak Leaf Suet Feeder. Made in the USA. Whitehall Oak Leaf Nature Hook, French Bronze, 15.25"